Scheme of the WP4: Task 1. Reliability and lifetime (left) and Task 2. Ageing (right). Quick link to Task 1. Reliability and lifetime is here and to Task 2. Ageing is here. Light-emitting diode based SSL products are becoming the replacement of choice for conventional lamps due to their unique advantages. However, the success of these new SSL products for market and consumer acceptance is highly dependent on their reliability. Currently, many manufacturers claim conflicting performance numbers regarding lifetime and reliability for their SSL products, which are very hard to verify and substantiate. 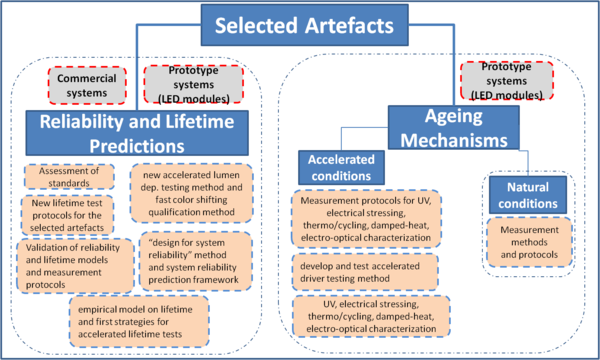 Additionally, there is a lack of proper lifetime and reliability test protocols, and internationally-agreed photometric/radiometric methods to test these LED‑based products. No standard exists for the estimation of an LED product's lifetime from failure modes, other than luminous flux depreciation. Therefore, the specifications for LED device lifetime usually presented by SSL manufacturers do not necessarily provide any indication of the product’s overall reliability. Moreover, US standard on LED lifetime testing, IESNA LM-80-08, is the one which commonly used by the majority of the international lighting community. This standard provides a method to measure luminous flux depreciation (“lumen depreciation”) – the amount of depreciated SSL optical flux over a certain number of hours of operation. However, it does not define a method to estimate “useful life” of SSL products, not covering LED‑based luminaires and lamps and does not provide any guidance on how to perform reliable predictive estimations or extrapolations to the defined “lumen maintenance”. SSL manufacturers generally have the capability to measure the decay of device performance over time. To some extent, they are also able to identify factors that accelerate this degradation, such as higher temperatures or current densities. However, it is much more difficult to understand the underlying physical and chemical underpinnings of a device’s degradation, as this requires the use of a range of high-end facilities and expertise. 2) determine major ageing mechanisms of novel SSL products. Use selected novel and established SSL systems for lifetime studies via subsequent lifetime measurements and ageing studies. On the basis of existing lifetime and reliability tests (like US standard LM-80), develop methods and protocols which are filling the gaps mentioned above. These measurement methods and protocols shall provide a framework for testing the lifetime of novel SSL products, such as OLEDs, CoF, and CoB. One important aspect in determining the lifetime of SSL products is the availability of robust models which can provide accurate and reliable lifetime prediction. The validation of the lifetime measurement methods and protocols and the establishment of traceability for these lifetime measurements shall be conducted with the final goal of the project to provide the stakeholder community with a guidelines and recommendations for new standards on lifetime and reliability testing, which will be disseminated to standardisation bodies. More details on Task 1 can be found here. The core of this task is development of measurement techniques designed to identify processes of degradation of novel SSL devices. · For operational induced ageing, the artefacts will be subjected to so-called “natural ageing” (at standard lab environmental conditions), where long-term (~ 20,000 hours) normal mode of operation of the SSL product will be performed. The main method is to monitor photometric/radiometric performance of the artefacts, and their temperature. · To simulate the influence of environmental conditions, so-called “accelerated ageing” of the artefacts is chosen including extreme temperature, humidity and application of UV. Unlike the natural ageing test, in which various degradation manifestations of the device emanate slowly, in this accelerated test much faster ageing effects can be observed. This will provide a better understanding of the interplay between various stimuli and device parameters in the degradation process. More details on Task 2 can be found here. "The research leading to these results has received funding from the European Union on the basis of Decision No 912/2009/EC."